b) the tyre load indices differ by no more than 2 (Note 3). 3. An asymmetric tyre is fitted to a vehicle with the ‘inside’ tyre wall facing outwards. 4. A directional tyre is fitted contrary to its correct direction of rotation. 8. A wheel is not compatible with the tyre fitted to it for rim profile, flange height or valve fitment. 10. There are signs that a tyre is fouling on another part of the vehicle. 12. A tyre has a string-type repair visible from the outside. b) if the tyre does not normally have moulded tread-depth indicators (such as some retreaded or vintage tyres), across at least three-quarters of the tread width. 14. A winter tyre (Note 2) does not have a tread depth of at least 4mm (excluding any tie-bar or tread-depth indicator strip) within all principal grooves that normally contain moulded tread-depth indicators and around the whole circumference of the tyre. 15. A tyre not identified as designed for regrooving has had its tread depth increased by regrooving. 16. A tyre is noticeably under- or over-inflated. 18. There are signs that a wheel is fouling on another part of the vehicle. 20. An alloy wheel has poor visible repairs. f) is an aftermarket wheel nut made from aluminium. Asymmetric tyre means a tyre which, through tread pattern, is required to be fitted to a vehicle so that one particular sidewall faces outwards. Cross ply means a pneumatic tyre structure in which the ply cords in the tyre carcass extend to the beads and are laid at alternate angles, which are substantially less than 90 degrees, to the centreline of the tread. This tyre structure is also referred to as ‘bias ply’ or ‘diagonal ply’. Directional tyre, also known as unidirectional tyre, means a tyre with a tread pattern that is designed to run in only one direction. A directional tyre usually has an arrow marked on the side wall indicating the direction it is designed to run. Load index is an assigned number ranging from 0 to 279 that corresponds with the maximum load-carrying capacity of the tyre. Most passenger car tyre load indices range from 62 (= 265kg) to 126 (= 1700kg). Pneumatic tyre means a tyre that, when in use, is inflated by air or gas introduced from time to time under pressure so as to enclose, under normal inflation, a cushion of air or gas forming altogether at least half of the total area of an average cross-section of a tyre so inflated. Ply rating is an index of tyre strength used to identify a given tyre with its recommended maximum permitted load when used for a specific service. It does not necessarily represent the actual number of plies in a tyre. Common ply ratings are 2, 4, 6, 8, 10 and 12. Commercial (eg truck) tyres often have a ply rating rather than a load index. Radial ply means a pneumatic tyre structure in which the ply cords, which extend from bead to bead, are laid at approximately 90 degrees to the centreline of the tread, the carcass being stabilised by an essentially inextensible circumferential belt. Run-flat tyre (also known as self-supporting tyre) means a tyre that is so constructed that in case of a puncture the basic tyre functions are still provided for a short distance (at least 80km) and at a reduced speed (usually 80km/h), allowing the vehicle to be safely driven to a place of repair. Some run-flat tyres are identified by an ‘F’ within the size designation. Tube means an inflatable elastic liner, in the form of a hollow ring fitted with an inflation valve assembly, designed for insertion into certain tyre assemblies to provide a cushion of air or gas that, when inflated, supports the wheel (also known as an ‘inner tube’). Tyre carcass means that structural part of a pneumatic tyre other than the tread and outermost rubber of the sidewalls that, when inflated, contains the gas that supports the load. Tyre load rating means the maximum load a tyre can carry at the corresponding cold inflation pressure prescribed by the tyre manufacturer and the speed indicated by its speed category symbol. It is usually indicated by the load index or ply rating. Wheel means a rotating load-carrying member between the tyre and the hub, which usually consists of two major parts, the rim and the wheel disc, and which may be manufactured as one part, or permanently attached to each other or detachable from each other. Wheel spacer means an additional component used for the purpose of positioning the wheel centre-disc relative to the hub, or in multiple wheel sets, for the purpose of positioning the wheel centre-disc relative to another wheel. Winter tyre means a tyre which is principally designed to be operated at temperatures of less than 7°C. 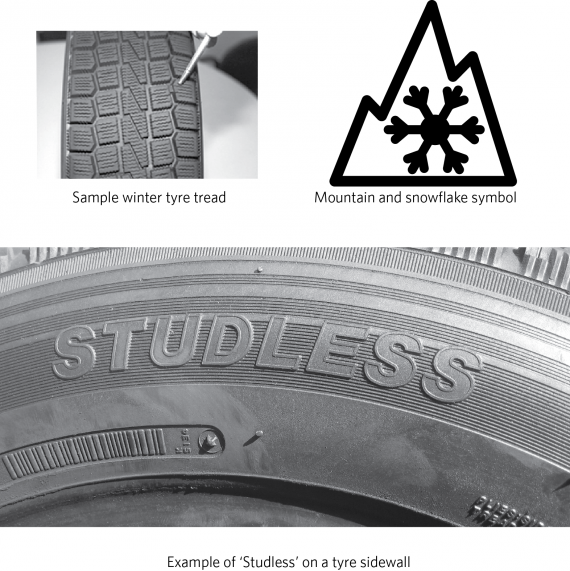 A winter tyre can be identified by its distinctive tyre tread pattern consisting of deep tread blocks with wavy sipes and is always marked with the word ‘STUDLESS’ and/or a symbol of a snowflake and mountain on the sidewall (see Figure 7-1-2). The tyre load index and speed category are usually marked on the tyre. Where the tyre is not marked, the load and speed rating information must be obtained from the tyre manufacturer or a reference guide of tyre ratings before the tyre can be passed. Sometimes a retreaded or repaired tyre has had its speed rating removed. Where a tyre has been repaired or retreaded in accordance with standard NZS 5423 (Repairing and retreading car, truck and bus tyres), the tyre must be marked with NZS 5423 and, if a car tyre, have the speed rating removed. In such a case, a missing speed rating is acceptable for WoF/CoF (unless the inspector believes on reasonable grounds that the tyre would not have had the required minimum speed rating for the vehicle in the first place). Note For WoF purposes, a tyre is considered to be a winter tyre only if it has BOTH a winter tyre tread AND a studless marking and/or mountain/snowflake symbol. The circled areas show where information has been removed so that the tyre can no longer be identified. 4. A directional tyre must be fitted to a wheel position corresponding to its direction of rotation. 5. The speed category of a tyre must be compatible with the maximum legal speed limit for the vehicle, or the vehicle’s maximum speed (Note 3) (Note 4). c) compatible with the tyre rim profile, flange height and valve fitment. 8. There must be adequate clearance for the brake, hub, suspension and steering mechanism and body parts. 13. A winter tyre (Note 2) must have a tread pattern depth of not less than 4mm (excluding any tie-bar or tread-depth indicator strip) within all principal grooves that contain moulded tread-depth indicators and around the circumference of the tyre. 14. The regrooving of a tyre is permitted only if the tyre is identified as having been specifically designed for regrooving after manufacture. 15. A tyre that is fitted to a vehicle must be maintained at a safe inflation pressure. 16. If the vehicle carries a spare tyre, the tyre must be securely attached on or in the vehicle. 17. The components of the wheel assembly must be in good condition. 18. The wheel must be securely attached to the hub.